Hard Landing - What Does It Mean? 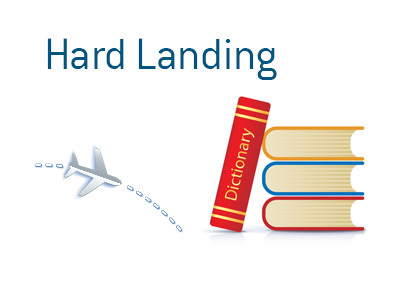 What does the term "hard landing" mean in the world of economics? What is the definition of the term "hard landing"? In economics, a "hard landing" occurs when an economy quickly switches from growth-mode to either flat growth or a recession. In order to prevent high inflation, governments will usually craft their fiscal policy in order to slow down the economy without causing a recession. For instance, if the rate of inflation was ticking uncomfortably high, the government may raise interest rates in order to slow growth. The goal of a government's fiscal policy is to have a "soft landing", which occurs when inflation ticks lower but growth remains high enough to avoid a recession. A "hard landing", on the other hand, occurs when economic growth slows to nothing or even reverses. For obvious reasons, governments will do their very best to avoid "hard landings".